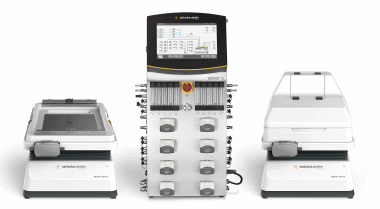 Sartorius Stedim Biotech (SSB), a leading international supplier for the biopharmaceutical industry has announced the launch of the Biostat RM TX single-use bioreactor, a new wave mixed system developed specifically for closed, automated expansion of consistent quality cell products such as ex vivo cellular immunotherapies. This new GMP platform combines SSB’s established single-use Flexsafe bag technology with the company’s expertise in biopharmaceutical automation. SSB’s new bioreactor is designed for scale-out expansion of cells including patient-specific T cells and is a closed system, consisting of an automated control unit and a up to two rocking platforms to gently agitate single-use Flexsafe RM TX bags (up to 5L working volume). The bag is the core of the system and built on SSB’s Flexsafe film, which is already well-established from clinical development to GMP manufacturing of vaccines and biologics by major global biopharma companies. The film formulation is developed to minimise leachables and extractables, guaranteeing consistent batch-to-batch culture performance of even sensitive cell types, such as genetically modified T cells. The proprietary Flexsafe RM TX bag is designed with a special port for hands-free gravity harvesting. In combination with the innovative Flexsafe RM TX Harvest Device it reduces the contamination risks from manual handling, maintaining cell integrity and cell viability. Unlike other cell therapy expansion systems which use pumps for cell recovery, this unique gravity harvest concept reduces the risk of shear stress on these delicate cells, to maximise cell number recovery. A benefit of using the bioreactor in combination with the Flexsafe RM TX bag for cell culture is the possibility for walk-away monitoring and culture control. The bags include single-use sensors for pH, DO and viable biomass. These sensors are integrated in the Biostat B control unit, and the system’s sophisticated software is set-up for fully automated process control of gases, flow rate, filling volume and substrate addition. With culture volumes greater than 500 mL, on-line analysis of viable biomass is also possible by connecting the single-use BioPAT ViaMass sensor. These sensors make the system suitable for running continuously in fed-batch or perfusion modes, saving labor, time and effort with manual sampling and also minimising contamination risks to precious patient cells. Using this bioreactor system, manufacturers can attach a second rocking platform and Flexsafe RM TX bag to each Biostat B control unit to scale-out their production. The system also provides a standard interface to common SCADA and DCS such as BioPAT MFCS and DeltaV.